Help your customers give the gift of giving. Now your customers will have the option to spread the word about your products or services. We offer personalized gift certificates that can be used in restaurants, nail salons, spas and more! High quality offset printing & custom numbering will make your gift certificate look great. Are you looking for a way to reward an employee of the month? How about a gift certificate – printed with your logo and customized with your information – offering a day off or a month’s use of that parking space right next to the building? Are you involved in local schools? Gift certificates are great items for a silent auction. 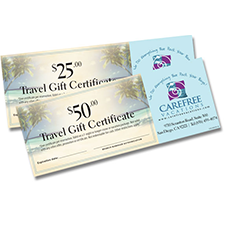 Whether you are recognizing your own staff or circulating some good will in the neighborhood, gift certificates can remind customers that you are looking out for them. Are you running a day spa? Gift certificates to your loyal customers will keep them coming back. Would you like something to remember your regular customers during the holidays? Gift certificates can highlight your products and services, or just your commitment to their business. 8.5" x 3.5" 9" x 4"